Create complex rhythmic patterns in a surprising new way. With Steps you can control any MIDI compatible app, send MIDI over the network to your laptop or any other compatible device, and even synchronize external hardware analog synths such as Korg Volcas or Pocket Operators via an audio cable. Automatically sends to all available MIDI input ports and our own virtual source. 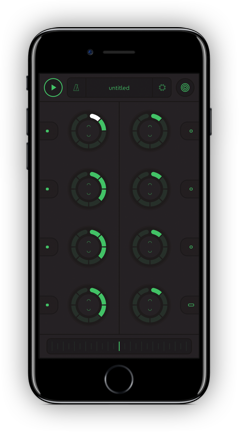 Connect your iDevice to an external MIDI interface and control MIDI Hardware. Synchronize external hardware synths such as Korg Volca or Pocket operators via the audio output. Play together and sync multiple apps and devices over WiFi.